A new high speed rail line being proposed along the Toronto-Windsor corridor could slash an hour off the trip between Toronto and London and begin service as early as 2025, Premier Kathleen Wynne said Friday. The high speed line has been discussed for decades, but the latest provincial budget allotted $11 billion over 10 years to support the first phase of the project. On Friday, Wynne said phase one would connect Union Station to London, Ont. in about 73 minutes. The shortest train ride currently available is around two hours and 10 minutes. “It’s the kind of project that doesn’t just create jobs, it also expands possibilities for where people can choose to live or work by fundamentally changing what commute times in this part of the province look like,” Wynne said at an announcement in London. 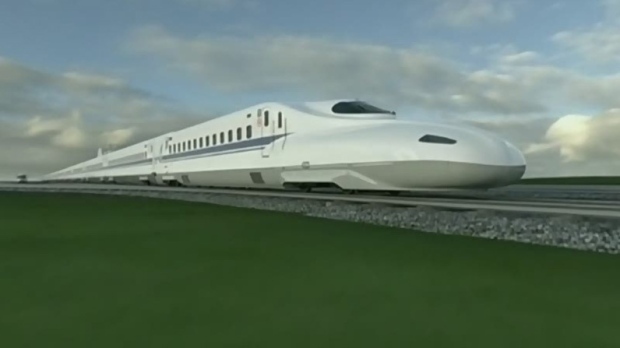 The new line would see trains moving at speeds of up to 250 kilometres per hour on a combination of new and existing track. The first phase would include stops at London, Kitchener, Guelph and Toronto, as well as a connection to Pearson International Airport. The second phase would extend the line to Windsor and Chatham. Work on the first stage of the environmental assessment began this year and is expected to take about three years to complete. Wynne said the province is aiming to have service begin in 2025. It’s not yet clear how much the project would actually cost.